Soon after stumbling into online Big Finish fandom, I was initiated into its battlecry: “Hail Frobisher the Big Talking Bird.” (There was also some quote about plum pudding.) Both are the fault of an unhinged writer named Rob Shearman. 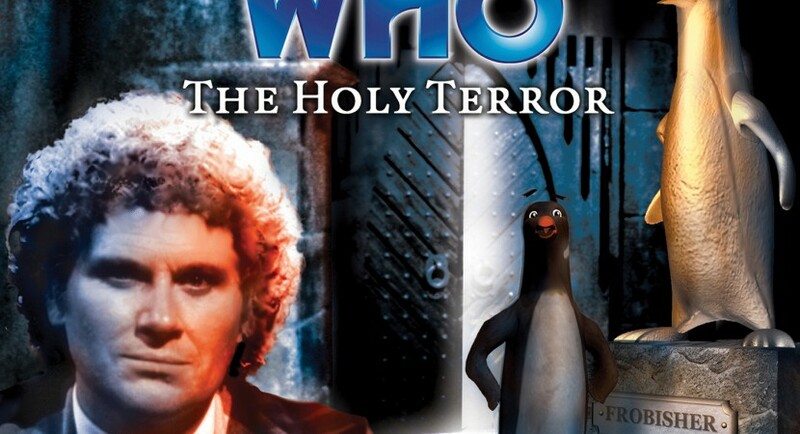 The Holy Terror is Shearman’s first foray into Big Finish. Thanks to a TARDIS temper tantrum, the Doctor and Frobisher crash the coronation of a pathetic young man whose main failing is that he knows he’s a loser. His queen, half-brother and high priest agree. The Doctor and Frobisher’s miraculous arrival are all that’s keeping the young king’s head on his shoulders. While the Doctor hurries off with the court scribe in search of answers, Frobisher stays behind to babysit the hapless monarch. Our erstwhile time travellers wind up on two sides of court intrigue. And then things get messy. The secondary characters are clumsily Shakespearean, but that’s deliberate. I’m not entirely thrilled that both women are shrewish queens, while the gents run the gamut from charming but inept young ruler to dastardly hunchback to absent-minded historian to loyal guard captain (Sejanus! Whom I can’t hep visualizing as Patrick Stewart with a ridiculous wig). Other than that, and a few gruesome scenes at the edge of my ick tolerance, I thoroughly enjoyed hearing this game of thrones deteriorate by slow subtle degrees from Pythonesque farce into grisly nightmare. Frobisher’s wild ride in the Doctor’s absence is a charming romp, carried along by his good intentions and earnestness. The Doctor, meanwhile, is a shrewd and serious soul throughout, watching with dread as he guesses what’s coming. His heart-to-heart with Frobisher at the end is one of Colin Baker’s better scenes (at least of those I’ve hit so far). This is early Big Finish, profiting from the loose rein that the EU enjoyed during the hiatus years. It’s one of the “Side Step” audios drawing from canon established in novels and, in this case, Doctor Who Magazine comics. Frobisher the shapeshifting penguin P.I. is a cartoon character imported to audio. It’s a credit to his voice actor Robert Jezek, Shearman’s script and Colin Baker’s aplomb that the transition from comic strip to audio drama not only works, but is so good that fans have been clamoring for more Frobisher audios ever since. Trivia note: About half the characters have the names of real Romans in the histories of Tacitus, while the other half are named after Frankish kings from a different century. It’s one more hint that the world is a historical fabrication. The basic idea of this story is not entirely original: many SF franchises have a virtual reality / world of fiction story where the characters turn out to be archetypes, puppets, and/or the author of the tale being told. But this is a well-done example of the genre, and the added twist that it’s a mental prison for a sick murderer is a nice twist. That baby is very, very disturbing. There’s some interesting psychological symbolism concerning fathers and sons, a sort of inverted Oedipus complex, that make this drama more than just straight horror for horror’s sake. I love the way some characters start trying to wriggle loose from their roles and choose to exercise free will. I don’t love the fact that in the end, there’s little point to most of the drama, since the stage burns down. Then again, the hollowness of the fiction is the point. This is another of those messy adventures where the Doctor and companion wind up as helpless observers, although they certainly functioned as catalysts to upend the status quo earlier on. About halfway through listening, before the big reveal, I began to feel that this world was Castrovalva as Castrovalva might have been if the Master had truly meant to torment the Doctor. I don’t think I was far wrong. The second “Side Step” audio, based on comics rather than TV continuity. It’s hard to say exactly where Frobisher falls in Six’s continuity, but I’m guessing this story happens during Six’s dispirited wanderings after Trial of a Timelord, before he falls in with Evelyn.